Holistic Fidget Making Its Way Into Schools, Offices and Homes Easing Stress and Boosting Performance! This new and unique fidget device targets energy zones within the body to stimulate critical nerve receptors through your fingers. Acu-Fidget promotes physical and emotional health, while creating an experience of relaxation through gentle and pressured massage. Roll the device up and down your finger to create sensations, ranging from gentle tingles to hard pinches, depending on your desired pressure. Feel focused. Feel clarity. Feel motivated. At first, Acu-Fidget users are intrigued by the interesting and revolutionary device. The user will then pick a ring with the healing properties that best reflects their needs. Rolling the Acu-Fidget up and down the finger sends all sensory nerves into action. Your senses are creating new sensations and relieving stress. You can now determine where on the Sensation Matrix you fit in! Your experience with the Acu-Fidget has left you feeling relaxed and rejuvenated! The Acu-Fidget is a discreet reflexology treatment that can travel with you anywhere. Revitalize your mind and body by promoting creativity and balance through the acu-points on each finger. To ease your nervousness and worrying, apply pressure by rolling the Acu-Fidget up and down your thumb. This will calm your nerves and relieve headaches. Muscle aches and frustration can cause irritability. When you use the Acu-Fidget on your index finger, it can inspire inner peace and relaxation. Irritable? Angry? Tired? Perhaps all three? The Acu-Fidget fights fatigue and soothes anger and irritability with applied pressure to the middle finger. Being negative drains energy. The Acu-Fidget reduces feelings of negativity and grief. When used on the ring finger, it can also aid in digestion. Arouse your creativity and tune into your intuition and wisdom with just your little finger. Apply pressure with the Acu-Fidget and you can also reduce anxiety and insecurity. 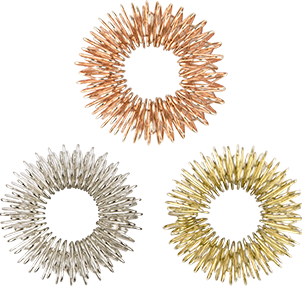 Not all people are the same, and that’s why the Acu-Fidget comes in copper, silver and gold. Each contains healing properties to benefit different emotional or physical needs. Benefits focus on brain synapses and nerves to improve their connectivity. This makes copper an essential mineral for overall balance and wellbeing. Balances moods and energy levels. Silver is also an anti-microbial agent and boosts immunity. It is also beneficial for balancing internal heat and regulation. Ideal for hot flashes and fatigue. Gold promotes the circulation of blood flow and alleviates rheumatoid arthritis symptoms. It also boosts oxygen flow. Ideal for the older generation. it’s a new experience! Where do you fall on the Sensation Matrix? Order Today and Get 45% Off!